Winter season is my favorite time to take my camera and go shooting. I am fortunate to live in one of the most beautiful places on earth, though the weather can be brutal. Us northlanders like it that way, it would be a lot more crowded here if it was warmer! 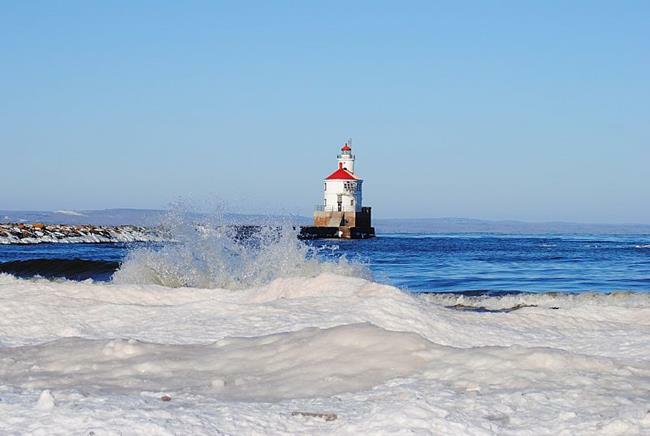 Along the shores of Lake Superior you find frozen waves in winter. As the waves rise to shore a tiny fraction of the moisture will stick and the frozen waves are formed. I particularly love the sight of icy ink blue water against a pale blue sky with snow and ice. The only thing that's better in my eyes, is if there is a lighthouse in the picture! Wisconsin Point is the longest freshwater sandbar in the world. It is Wisconsin's best kept secret, for even on one of our rare hot days, there are relatively few people on the beach. Nikon D3000 Promaster AF70-300 lens.